There’s a new coach in Adam Gase. They’ve got a handful of new players, including star running back Le’Veon Bell. 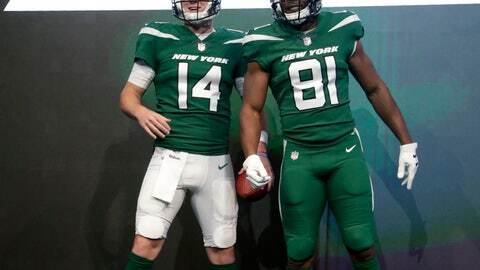 And, now, the Jets have a new look on the field. “I love them, man,” said Adams, the Pro Bowl safety who joined quarterback Sam Darnold, wide receivers Robby Anderson and Quincy Enunwa, tight end Chris Herndon, defensive lineman Leonard Williams and linebacker Avery Williamson in modeling the new threads on a stage at Gotham Hall. The uniforms will feature combinations of a unique shade of green called “Gotham Green” — a change from the team’s familiar hunter green — and “Spotlight White,” along with “Stealth Black” that’s featured in an alternative uniform the team can wear up to three times in a season. The jerseys also feature “New York” in small letters across the chest and above the players’ numbers. The shiny helmet is all green, replacing the white headgear the players wore the last 20 years. The refreshed logo features the letters “JETS” in white, with a white football under it. It’s all part of a team-wide rebranding through a process that began in 2014, with the Jets working closely with the NFL and Nike. The new colors and logo will be plastered all over their facility in Florham Park, New Jersey, as well as throughout MetLife Stadium for home games. There will also be modifications made to the end zones and walling inside the stadium, along with video graphics. Jets owner Christopher Johnson was all smiles about his team’s new look, saying it was time to refresh things for the franchise. “I think it came out pretty great,” Johnson said. More than 400 fans were in attendance for the unveiling, which was hosted by comedian J.B. Smoove. Former Jets stars Joe Namath, Wayne Chrebet, Curtis Martin, Freeman McNeil, Marty Lyons and Nick Mangold were also there to see the new uniforms and logo, as were “Saturday Night Live” star Pete Davidson, and a small contingent of WWE stars. “Our team really did a 360 (degree turn quickly),” Anderson said.